Below is a list of questions most frequently asked by our customers. If you have a question and do not find it on this list, please call us at 1-800-374-7106 and one of our friendly and knowledgeable building specialists will be more than happy to answer any questions you may have. What size buildings do you offer? 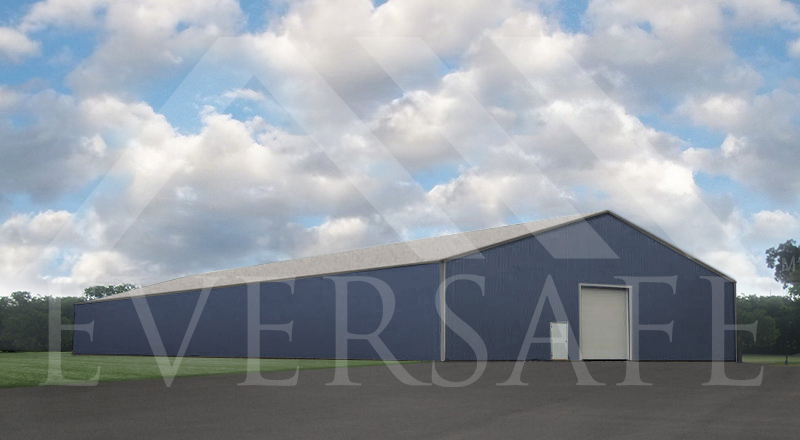 Depending on where you’re building we offer buildings ranging in size from 8’ x 8’ x 5’ up to 150’ wide in virtually any length (Building measurements are Width x Length x Height) and any size in between. If you have a size in or special design or application in mind please contact one of our building specialists to get a price on your specific needs or custom plans. What is the widest building you supply? 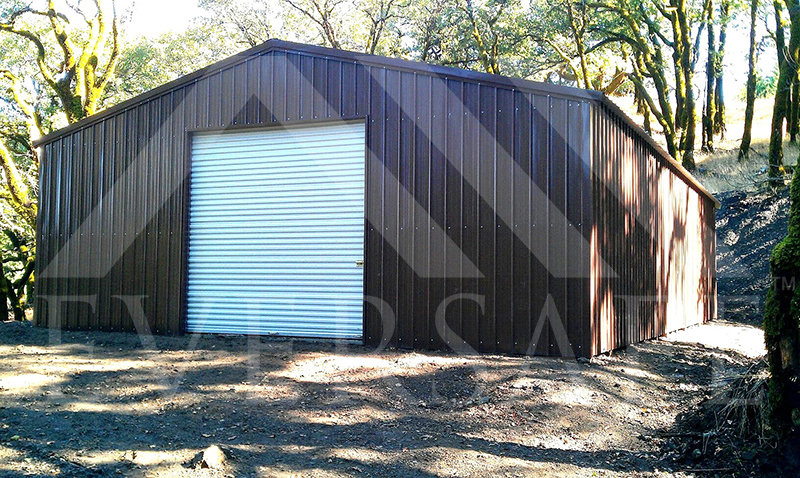 We supply up to 50’ wide on standard garage buildings. 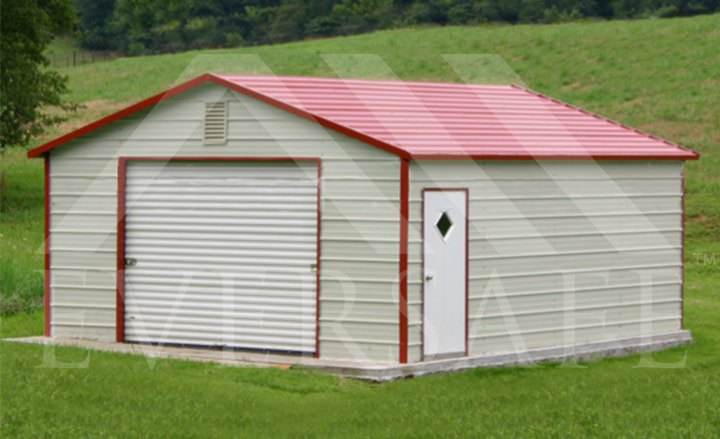 For commercial buildings, sizes range from 60’ to 150’ wide. Yes. If you have a size in mind please contact our offices and one of our customer service representatives will be happy to provide you with a price. What is the highest wall height you offer? Depending on where you’re building we offer wall heights of up to 20’. Please contact one of our building specialists to discuss your needs. The dimensions of our buildings are the outside measurements of the roof which has a 6” overhang on each end, so the building itself is one foot shorter than the roof. The width is measured from the outside of base to outside of base. For Example: A 30’ x 41’ x 12’ building’s actual dimensions are 30’ x 40’ x 12’. The size of your pad will depend on where you’re building, whether or not you’re going to pour a footer and whether or not you’re going to pull a building permit. Because the foundation dimensions will vary state by state please contact one of our building specialists at 1-800-374-7106 to find out the best solution for your foundation requirements. Does my building site need to be level? Yes your building site must be level to insure the proper installation of your building. Make sure to obtain all local permits, research any subdivision covenants or restrictions and identify any zoning department setback requirements or easements. Make sure you have power available within 50 feet of the jobsite for our installers. Depending on your state regulations, local zoning laws, or location you may require a building permit. It is your responsibility to check with your local building department. 4’ braces are required in cases where the leg is 8’ high or higher on buildings that are not fully enclosed. The braces are included on all certified structures that are not fully enclosed and on all triple-wide buildings. Do you supply additions to the building after it’s already been built? In most cases, yes. However we will only supply them for our buildings and not any third party buildings. What types of anchors do you use? Wedge anchors are used for concrete installations. What different roof styles do you offer? Regular Style: These roofs have rounded eaves/corners and are the most economical and affordable of the three styles. Boxed Eave Style: The roofs are designed with an “A” frame roof truss and horizontal roof panels. The eaves are squared and look more like a traditional roof. Upgrading to a Boxed Eave style roof is an affordable way to improve the overall look of your building. 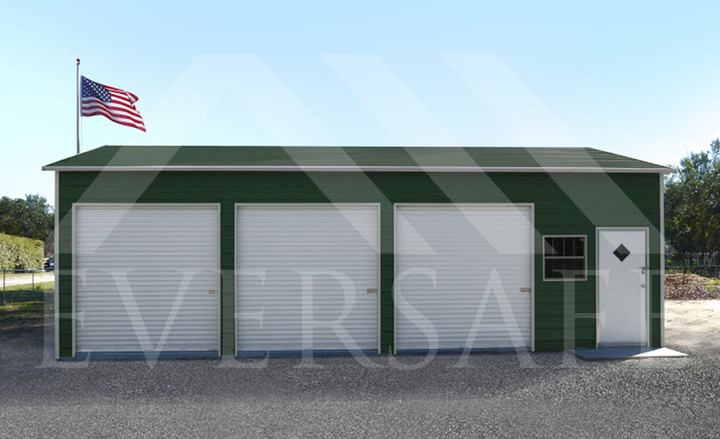 Vertical Roof Style: These roofs are similar to the Boxed Eave Style roof but they include vertical roof panels and a hat channel that runs the length of the roof to cross brace the roof and provide a mounting point for the roof panels. This design helps prevent rain and snow from accumulating on the roof. 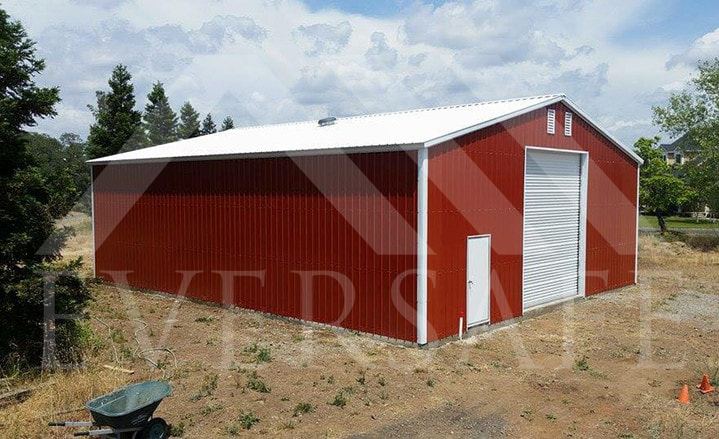 Our Vertical Roof Style buildings come with a ridge cap and specially designed wider trim that give the product a more finished appearance. Boxed eave style roof is most attractive and the Vertical roof offers the best protection against leaks from heavy rain and snow accumulation. What is the usable height in the center of the building? Click here for inside clearance tables. How far apart will my frames be spaced? In most cases the spacing of the frames will be 4 or 5 feet depending on building code requirements. We offer a variety of colors. Please see our color chart for color options. Do colored walls, roof or trim add to the cost of your buildings? No, you may choose any of our colors and choose different colors for the roof, the trim, the sides and the gable ends at no additional charge. A certified building is one that is engineered to meet specific snow and/or wind loads. Since many areas in the northeast require that a building meets a specific snow load, and many areas along the coast require a specific wind load, if you live in any of these areas you should be aware of your local building code requirements and purchase a building that meets those specifications. In many cases if a permit is required, you will need a certified building. What is the gauge of the sheeting? 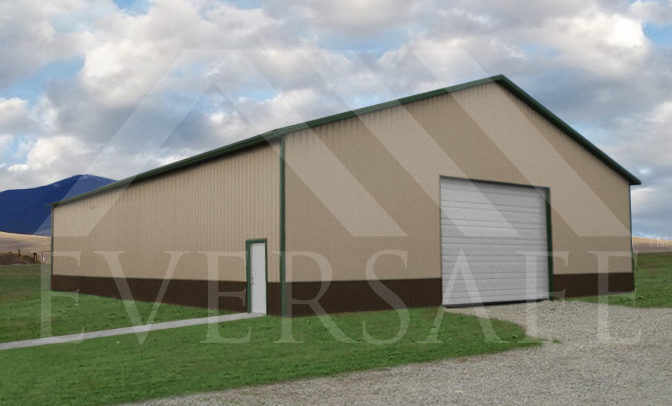 A down payment is required to start the process of ordering and manufacturing your building. 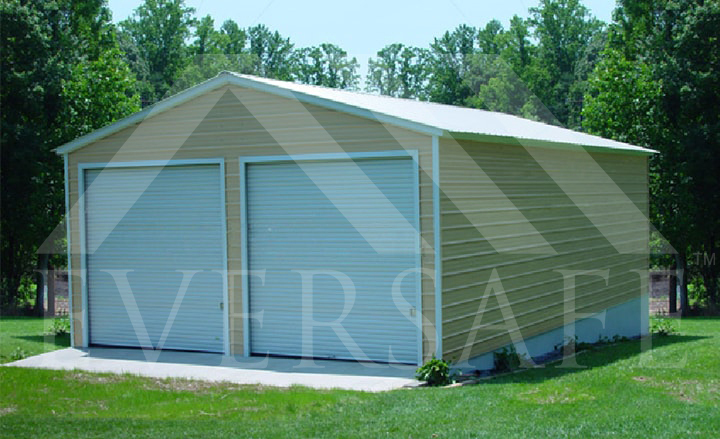 The balance of the sale price is due upon the delivery and installation of your building. Do I have to pay sales tax when I purchase a building? Unless you reside in a tax-free state or can provide a copy of your agricultural or sales tax exemption you must pay sales tax. However, Federal and state governments are tax exempt. How do I order an Eversafe building? Contact one of our building specialists at 1-800-374-7106 and they will be more than happy to walk you through the process of ordering an Eversafe building.